If tokenization is supported by your selected 3rd party payment processor and you have existing customers with tokenized payment methods on file, then use only the tokenization fields starting on No 72 below and not the credit card or ACH fields. For example if a customer had a single credit card that was tokenized by your payment processor, then populate the customer data (fields 1-26) and the 1st tokenization record (fields 72- 82). 75 expiry1 N The expiry date for the underlying instrument (credit card expiry date or ACH authorization expiry). If not provided, then no expiry notifications can be sent. 82 friendlyName1 N The customer assigned name for this tokenized payment method (eg: "Capital One Visa"). The BluSynergy system usually assigns something like "Visa - 9876" for newly entered cards, the data import file should use something like "my creditcard" if unknown. 75 expiry2 N The expiry date for the underlying instrument (credit card expiry date or ACH authorization expiry). If not provided, then no expiry notifications can be sent. 82 friendlyName2 N The customer assigned name for this tokenized payment method (eg: "Capital One Visa"). The BluSynergy system usually assigns something like "Visa - 9876" for newly entered cards, the data import file should use something like "my creditcard" if unknown. 75 expiry3 N The expiry date for the underlying instrument (credit card expiry date or ACH authorization expiry). If not provided, then no expiry notifications can be sent. 82 friendlyName3 N The customer assigned name for this tokenized payment method (eg: "Capital One Visa"). The BluSynergy system usually assigns something like "Visa - 9876" for newly entered cards, the data import file should use something like "my creditcard" if unknown. 4. Save the template on your desktop and upload it into the system. 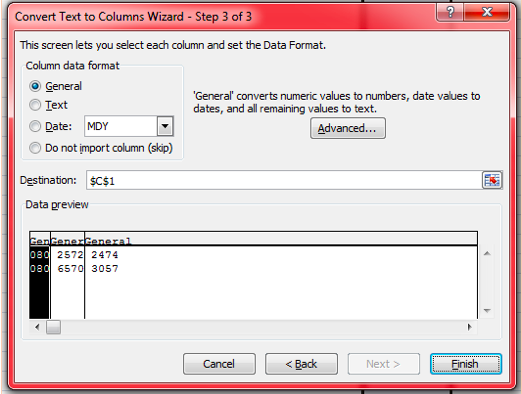 If you wish to left-pad certain numbers with leading zero's (the customer a/c number, or order number for example), then use this formula: =TEXT(A1,"00000000") This creates a eight digit number, then make sure you select the whole column and save the format as "text", else Excel will trim the zeros of when you save it as a CSV file. Use the Text Import Wizard to specify Text format for certain fields within your import file. Start by opening Excel to a blank workbook and from the Data tab's Get External Data group, click the From Text button. After clicking From Text, select your text file from the Import Text File dialog and click Open. This launches the Text Import Wizard. There are three pages to complete. The first page is essentially to determine whether the file is to be considered Delimited or Fixed Width. The second page depends upon the first. You will be asked what characters to consider as delimiters or asked to choose the widths of a fixed width file. The third page is what is going to help you determine the format of each field. Select your account id field from theData preview at the bottom then select Text from the Column data format list in the upper left. Note that the header of the field in the bottom Data preview has changed to Text. 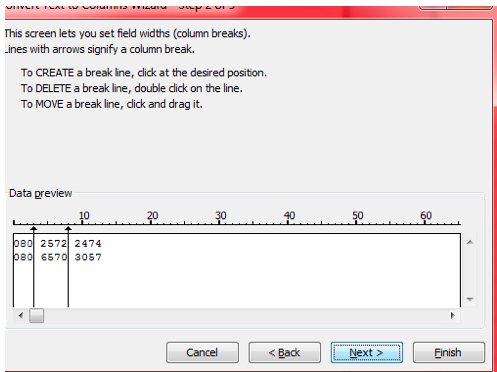 Repeat for any other fields and click Finish in the lower right to complete your operation.